When it comes to location, Hostelling International USA couldn’t have picked a better place to open their newest hostel. I first heard of HI USA when I was planning my trip to Boston a couple of months ago. The HI Boston came highly recommended so I ended up booking two nights there for my short weekend trip. Then during the conference I was attending, I met Netanya (Communications & PR Manager) who told me about HI USA’s newest hostel that would be opening up in Miami. Netanya was kind enough to invite me to check out HI Miami Beach and enjoy the live music that was going to be playing at the taqueria on the first level of the hostel. The property is in the process of converting from the Hotel Eva into the hostel and is undergoing some construction to create dorm rooms, but you wouldn’t know that from the looks of it. Looking around, it was clean and there were people coming in and out. And it was completely booked! I had hoped to get a picture of a room, but all rooms were occupied. That’s ok though, it gives me an excuse to go back in September once they have finished renovations. While I walked around and took pictures, I chatted a little with Michael who was manning the front desk which is on the second floor. He was really nice and very helpful. He recommended I try the sangria downstairs. So I did! I really liked it and really enjoyed the whole atmosphere of the open area in front of the taqueria called Taquiza. There was a diverse crowd and I could hear a few different languages being spoken, which is probably the coolest part of being at a hostel. The vibe was really laid back and casual and made for some great people watching. It was also great that they had live music. Boris and Andrew, both from Portland, Oregon, were playing softly in the background. Andrew had a lovely voice and I could have watched Boris play for hours; you could tell they were both very passionate about their music. I’m really curious to see how South Beach’s newest hostel turns out and can’t wait to go back in September. It really is in a prime location. 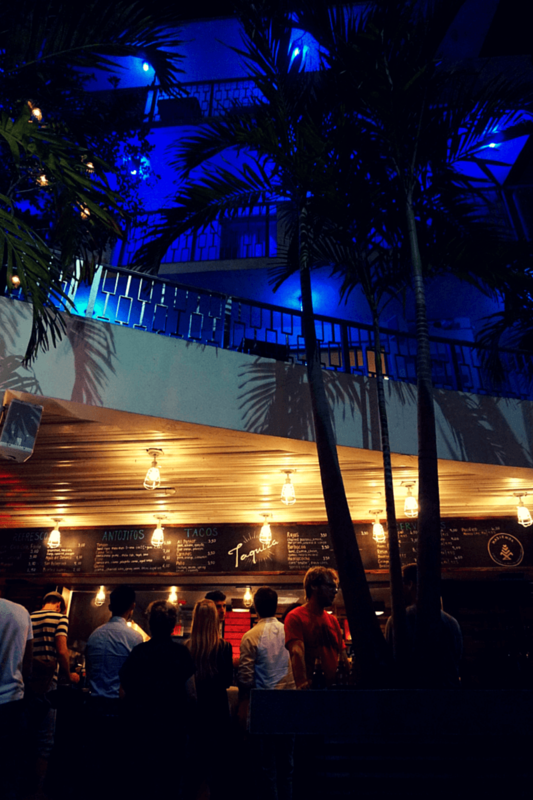 It’s on 15th and Collins and you can walk a block to the beach or walk a block to Lincoln Road and check out all the awesome restaurants and shops. There are bars and clubs within walking distance too. You really can’t beat it. Thanks again to Netanya for the invitation. We stayed in the HI Austin for SX and it was a dream! This HI looks incredible, we will keep that in mind for our Miami month in January. I will need lots of details from you when you return! Wow! Nice place huh?! Will keep this in mind. Miami is such a “hot” place to visit. Although this sounds like a place for young people, not like us! A hostel receptionist in suit and tie! Looks like a fun place to stay. Hi Amanda! It definitely isn’t your average hostel. This is much nicer than the mental picture I had of a hostel. This seems like something definitely worth checking out. Thanks for the post. Yes, I was definitely impressed. 15th and Collins, a great location indeed. It looks like a great place to stay and enjoy Miami. Would you say the hostel is family friendly? Hi Brenda! I think it is. Just keep in mind that at night in that area there will be a lot of partying adults. I have to say that it certainly doesn’t look like your average hostel. Looks pretty swanky. I love the way you include Buddy in many shots. He’s adorable! Aww, thanks so much Sue! And so far, HI USA hostels have really changed the way I look at hostels. Love the photo of Buddy with the front desk 😀 Sounds like a fab spot to experience Miami – a block from the beach works for me!! Thanks for the tip! That looks like it will be a fun place to stay, excited to see how it turns out!